I have met a variety of interesting people from all sorts of places, but each share a love of food and good company. Many of the folks I have met have also had their children tag along for their culinary experiences, some begrudgingly, but most, surprisingly, willing and even enthusiastic. The Niñas: For a cooking class I met “dos gorditas” (mom’s pet name for her girls), ages 9 & 10, who where quite the little troopers. Mom had them on a highly packed schedule in Cozumel for the day. These girls participated in the Cozumel Amazing Race before taking the Cozumel Chef on. What was most striking about this encounter was that one of the little girls was recently diagnosed with diabetes. Nervous, but willing to take on the challenge it gave me an opportunity to do some research. However, what I took away from this experience is that this disease did not phase this little girl. Sure she had to “count-carbs” and occasionally take insulin shots, but with a few food substitutes (especially with sugars) she was able to participate and eat everything we made. No fear! The Children’s Menu: Yes, Cozumel Chef does have a “children’s menu”, but what I am finding is that many parents make their kids eat what they are having. NO if’s, and’s or but’s! One general trend I have seen, is if mom or dad are the “chef’s” at home (little eating out) these kids will eat anything. Grocery list’s are also indicators of whether a household cooks. You should have seen this list for a woman and her children that I shopped & cooked for. What was most interesting is that she “checked-off” the majority of the Mexican ingredients on my list. She was looking to experiment and learn (with her kids as the guinea pigs). In the end, the children fell in love with my Yucatan Roasted Chicken and esquite custard, mom even asked for the recipe which I was happy to oblige. Ages 10 & Under: Sometimes, you need to entertain the younger one’s too, especially if dad just ran the Ironman Cozumel and is having a nice three-course meal prepared for his family and friends to celebrate. How do you entertain kids while the “adults” are having cocktails & guac….MAKE CHOCOLATE CHIP COOKIES! The children of this vacation rental eagerly saddled up to the island counter with me. With legs dangling, chocolate smeared on hands & faces, they helped roll out cookies for dessert. I think dad was appreciative, but I kept thinking how amazing for his children to see their dad, “Super Dad”, finish an Ironman. Truly an inspiring lesson. A Chef in the Making: Foster a kid’s passion and give him the tools (or a chef’s knife) and they make for great sous chefs. A strawberry blond kid named Jack really impressed me with his passion for food and his knowledge of. His parent’s basically had a private dinner for two since their son wanted to help me in the kitchen. What struck me was when Jack asked me if I had any cookbooks by Jacques Pépin! This child, barely the age of 11, knew who Jacques Pépin was?!?!! Boy did I have a story for him….I have met Jacques. I have even had coffee with him and when I told Jack this his eyes lit up. I showed him Jacques’ memoir “The Apprentice: My life in the kitchen” that Jacques gave to me and autographed. Little Jack practically screeched and dashed out of the kitchen to show his parents. The Niños: Be spontaneous and make your kids try new things. The whole fried-fish place on my food tour is definitely a highlight. It is also the perfect family restaurant to gross out your boys by eating an eye ball (as one father did for their adorable freckled son Joshua). Or, even let your kids eat those eye balls as my new pal Ethan did recently on a tour (BOTH of them). The food tour is an opportunity to get your kids to try new things (sorry for the plug in advertising, but what?!? it is). Especially with boys, I don’t know what it is, but that fish head draws them in. This kid also ate everything else on the tour. He was willing to try it and certainly willing to give his opinion. He was one of the most precocious 8 year olds I have met. Ok, probably not fair when mom & dad own an Olive Oil Farm and he has been growing up in northern California, a foodies dream. But this kid’s “hunger” for great food and adventure is refreshing. At the empanada stand he would nod/ shake his head in agreement with what mom & dad were saying about the tasting. He was a part of the conversation. This also wasn’t the last time I got to see this guy. His parent’s hired me to cook for Father’s Day and little E was super excited to see me again, waiting at the condo door in fact. He helped me transport the goods to the kitchen and even unpacked, placing my pots and pans on the stove. But as it is for most children, regardless of age and what type of family they come from, he couldn’t wait for dessert to be served. And as the story goes, “if you give a mouse a cookie (or raspberry & mango tart)”….he will probably lick his plate clean! Thank you to everyone who has shared their culinary adventures with their children and including me. Also, thank you Michael & Monica for sharing your son and your gifts, fantastic Olive Oil from Calolea. Here is a recipe inspired & made from your oil! Preheat the over to 400°. In a large baking dish (note: a baking dish that will let you evenly spread the figs is preferable & better for roasting) toss the figs with thyme, wine/liquor, sugar and honey. Spread figs out evenly in dish and roast. 15-20 minutes if figs are already soft or 30 minutes if your figs are firm. Cool or store up to 1 week. Put roasted figs & juices to a large saucepan. Add Limonata, water and bring to a boil. Once at a boil add the sugar. Reduce the heat and simmer for 20 minutes or until the mixture is thick & “gloppy”. Jar the jam and refrigerate up to 3 months. Preheat the over to 375°. Use a 9×13 inch baking pan and line the bottom of the pan with parchment paper. Coat all sides with vegetable spray. In a medium bowl, mix flour & baking powder. In a large bowl, mix yolks with olive oil, water, thyme, salt, vanilla and 3/4 cup + 1 Tbsp sugar. Beat mixture with hand-held mixer on medium speed until frothy (approx. 3 min). Add flour at low speed and mis until well incorporated. In a clean medium mixing bowl, beat egg whites until foamy. Gradually add 1/4 cup + 1 Tbsp sugar. Beat until stiff peaks form, thick & glossy (be careful not to over beat). Take a cup of egg white mixture and incorporate into batter. Stir until combined. Fold in the remaining egg whites until you no longer have “steaks”. Bake for approximately 35 minutes until the cake is golden brown and the cake starts to pull from baking dish. Cool for about 20 minutes before removing from baking dish & glazing with Limonata glaze. In a small bowl, whisk together Limonata & powder sugar. 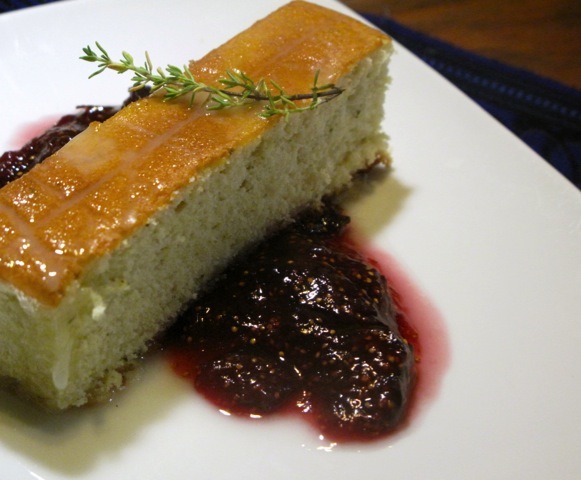 To serve; cut cake and place a piece on plate with fig jam. Lightly glaze top of cake as desired. Garnish with a sprig of thyme. *Cake recipe adopted from the Food&Wine. **Checkout Cozumel Chef’s Bodega for more products I like!